The two pictures shown with today’s column present a striking study in contrast. The charming interior shown above envisions the possible transformation of the bare room, shown below, in the old King of Prussia Inn. After a bill authorizing the sale or lease, by the State, of the historic old King of Prussia Inn to a patriotic or historical society, or to a veterans’ organization, had been signed by Governor George M. Leader just a year ago, tentative plans already made for its restoration began to crystallize at once. Although an unexpected turn of affairs had made it impossible at the moment, to put these plans into effect, the large group of interested individuals and organizations hopes that the delay is only a short-lived one. Among the organizations most interested are the recently formed King of Prussia Historical Society and the Sgt. Jack L. Jacoby Post, American Legion. Both of these groups offered to take title of the Inn last July. The historical society put itself on record as being in favor for the preservation, restoration and use of the King of Prussia Inn as a community building. At that time its members stated their willingness to accept the deed and title, provided there was no stipulation as to the necessity for moving the building. This decision was made because of the experienced opinion that any attempt to do so would result in the collapse of the old Inn. Still other local groups which went on record as being interested in the restoration and preservation of the old building were the Philadelphia Landmark Society, the Valley Forge Historical Society, the Roadside Council and various civic associations in the King of Prussia area. Tentative plans were soon under way for the establishment of a much needed branch of the Montgomery County Library in the Inn, after the latter had been prepared for occupancy. Some of the groups were willing to contribute to the funds for restoration in exchange for the privilege of holding meetings in the inn. One group, indeed, offered such a generous contribution to the proposed fund that the necessity of putting on an organized fund raising campaign might be obviated. Definite plans for making the old building, weakened as it is by age, into one fit for practical present day usage, have been developed after a close study of the entire structure. Recommendations of the restoration committee call for strengthening of the floor supports of the first floor center sections and replacing any floor joist which is considered unsafe. Second on the list is electrical rewiring of the entire first floor and elimination of any old circuit above this floor for the present. A third recommendation has to do with overhauling of the heating and water systems. Further plans would include a complete renovation of the five rooms on the first floor, as well as of the kitchen; painting of the exterior and landscaping of the grounds around the inn; lastly, improvements in other parts of the inn, to make the general restoration more complete. How this may be made into a community project, with much of the labor on the volunteer basis, will be told in next week’s column. To those of us who have been familiar with the weather-worn signboard that hung for many years outside the King of Prussia Inn, the picture below, showing the famous king brandishing a sword as he sits astride a spirited horse, is almost startling by way of contrast. 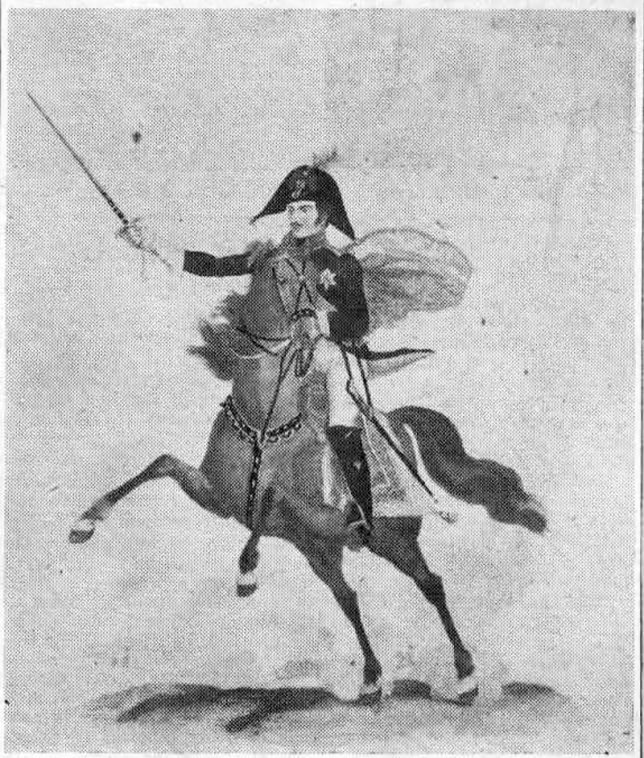 Elise Lathrop, in her comprehensive volume on “Early American Inns and Taverns,” published in 1926, describes the original signboard as “showing the King of Prussia, somewhat marred by wind and weather, astride a horse, decidedly wooden as to its legs.” The signboard was supposed to have been painted by Gilbert Stuart. A photographic reproduction of the lithograph of the King of Prussia, for whom the famous old inn was named when it was built in the 1700’s. In the picture shown above, the fiery-eyed steed with flowing mane and tail, ridden by a dashing king in handsome uniform, more nearly fulfills the popular concept of the monarch. The lithograph from which this picture has been made, is in Mrs. L.W. Morrison’s antique shop across the road from the old inn. It was originally published in London by Thomas Kelly in July, 1815. The inn itself is rather a dreary spectacle these days, standing closed up and entirely deserted on a traffic island between the north and south bound lanes of Route 202 and Route 23. It is just a year ago last month that the Pennsylvania House of Representatives passed a bill permitting the sale of the structure. Unlike former proposed bills, this one did not stipulate that the building be moved from its present location within a stated length of time. This was important to would-be purchasers, anxious to preserve the historic old landmark on its original site, particularly in view of the fact that the old structure might disintegrate in the moving process. The inn had previously become the property of the State when it was purchased from Anna P. Waters at the completion of plans for the Pennsylvania Turnpike route. Because the State did not deem this “island” location a safe one, the House State Government Committee had originally stipulated that any purchaser of the property must move the inn, within 18 months after purchase, to another location. Since that proviso was eliminated last summer it is now said that the sale of the property has been held up by certain claims to the ground on which it stands, made by the former owner. Among those most disappointed by this latter development are members of the King of Prussia Historical Society, an organization which obtained its charter and incorporation papers a year ago from the Montgomery County Courts. Recent issues of this column have told of this Society’s plans for “the Preservation, restoration and maintenance of historical landmarks, materials and other objects pertaining to Montgomery County and to the history of Upper Merion Township.” Incorporators of this new Historical Society are Dr. Robert May, Mrs. Lucressa Morrison and John R. Arscott, all of King of Prussia; Mrs. Mary Townsend and Dr. Deane Webber, Wayne. If arrangements can be made for the eventual acquisition of the King of Prussia Inn by this new society, there are many plans under consideration both for its restoration and for its use by various groups and organizations. Next week’s column will contain a resume of these contemplated plans. Last week’s “Your Town and My Town” told the story of what was one of the most interesting and best preserved of the old houses in the general Valley Forge neighborhood, prior to its razing to make room for a modern restaurant. This was the Alexandar H. Crockett homestead, located at the northeast corner of Gulph and Swedesford roads. 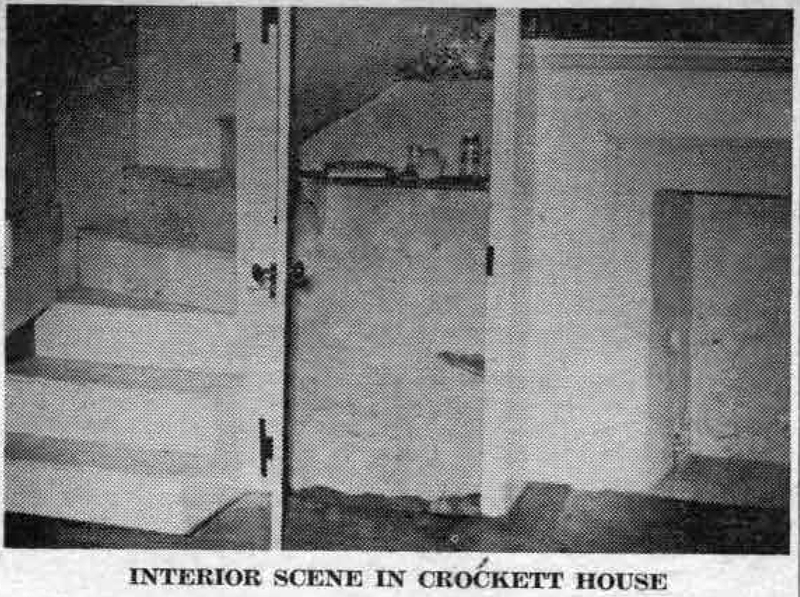 An interior picture of a downstairs corner of the old Crockett house is shown with today’s column while an exterior view was printed in the column of June 29. 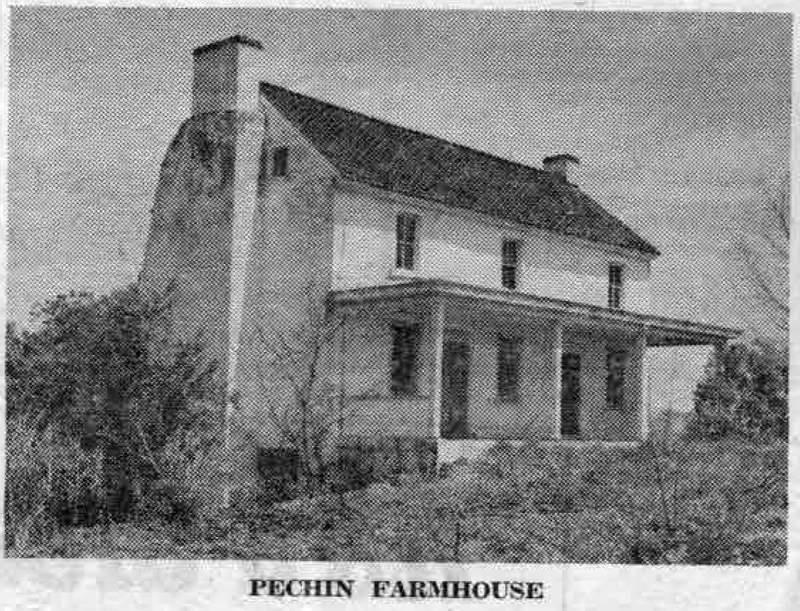 Situated on Route 23, across the road from the Valley Forge Golf course, this house has been known for many years as “the Pechin farmhouse.” It was formerly the property of a member of that large family, of which the late Nathan P. Pechin, well-known in Radnor Township, was a member. The history of this house was filed in the records of the King of Prussia Historical Society by Miss Anna Pechin, a long-time resident of the Upper Merion area, now living in Jeffersonville, who is an active member of the Valley Forge Historical Society. According to Miss Pechin, who owned this farmhouse at one time, its earliest record dates to a sale of the dwelling by Moses David to James Aiken on July 31, 1790. The date of construction probably antedates this by many years, since there is a Benjamin Davis listed in the census of 1734 as owning 100 acres in Upper Merion. In the cellar there is still the large room which was originally used for cooking purposes. A center stairway goes from the basement to the attic. There are two rooms on the first floor and two on the second. The attic seems to have been used for storage space only, as there is but one small window in it. Of this stairway, the only original part still remaining seems to be that between the second floor and the attic. The first and second floor mantles and woodwork have been completely stripped by vandals. Interesting enough, the original woodwork of the window frames is still in place, although concealed beneath the present woodwork, which was to build up the windows and doors after the last coat of stucco made this necessary. The plaster is original and the lathes are of the old time handsplit variety nailed to thick upright boards. A representative sample of the original paint used in the kitchen is on file with the Valley Forge Historical Society. The exterior of the house is of stone. 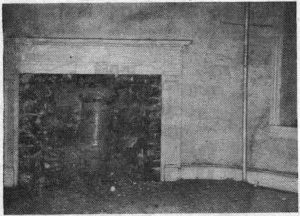 The massive chimney on the west end, shown in the picture is not enclosed in the present walls. However the chimney on the east end, which was removed when the house was extended, appears to have been enclosed. Surely this house presents a challenge to someone with the initiative and the time, as well as the financial means, to restore a home dating back to the early 1700’s. Its proximity to Valley Forge, and the fact that it probably was already standing when Washington and his men camped at Valley Forge in 1776, only enhances its interest to any future owner. Last week’s column told of recently formed plans of the King of Prussia Historical Society to preserve landmarks, including old houses and other buildings in the general area of Valley Forge. This includes the King of Prussia settlement, long famous because of the old Inn of that name. In spite of the changes recently made in this section by the building of the Pennsylvania turnpike and the Schuylkill expressway the old Inn is still standing, its future as yet undetermined. But as further told in last week’s column, the old Alexander H. Crockett homestead did not fare so well. Despite the earnest efforts of Mr. Jack Crockett and of the King of Prussia Historical Society to preserve it, this old home has been torn down to make room for a Howard Johnson restaurant. The Historical Society’s general plan is to make complete surveys of old buildings that seem doomed to destruction, despite the Society’s efforts to preserve them. However, this type of professional work pre-supposes that some preliminary investigation has already been done by local historical societies in anticipation of the professional work. The survey of the Crockett place is of especial interest to readers of this column, since the family has been well known locally for many years. Like many another home in the Great Chester Valley section, the Crockett place had an interesting history. Situated on the northeast corner of the intersection of Gulph and Swedesford roads, the building had originally consisted of two dwellings which had been joined together in recent years by moving the west wing back against the east wing. The small stone farmhouse was jacked-up and moved without “a single crack appearing in the plaster.” This moving was done by the late A.R. Crockett and his son, Jack. The exact date of the east dwelling is not known, though the date shown on the west building reads 1757. In Mr. Crockett’s possession is a deed bearing the date 1792. This deed traces the land back to Rees and Griffith Rees, both of whom are listed as landowners in Upper Merion township in the census of 1734. Of this land, Griffith Rees owned 50 acres and Thomas Rees, 100 acres. From an historical point of view this information is particularly interesting, in that the deed receipt traces the land to Rees Thomas, who was the brother-in-law of Letitia Penn Aubrey, by virtue of his marriage to her husband’s sister. He acted as her attorney in collaborating with James Logan, when Letitia Penn Aubrey decided to dispose of her manor of “Mount Joy.” This land transaction dates back to November 16, 1714. However, there is some question as to which home is designated by this deed. According to the King of Prussia Historical Society authorities, there have been so many alterations to the old building that it is impossible to [have] concluded that this represented the original plan of the house, however. 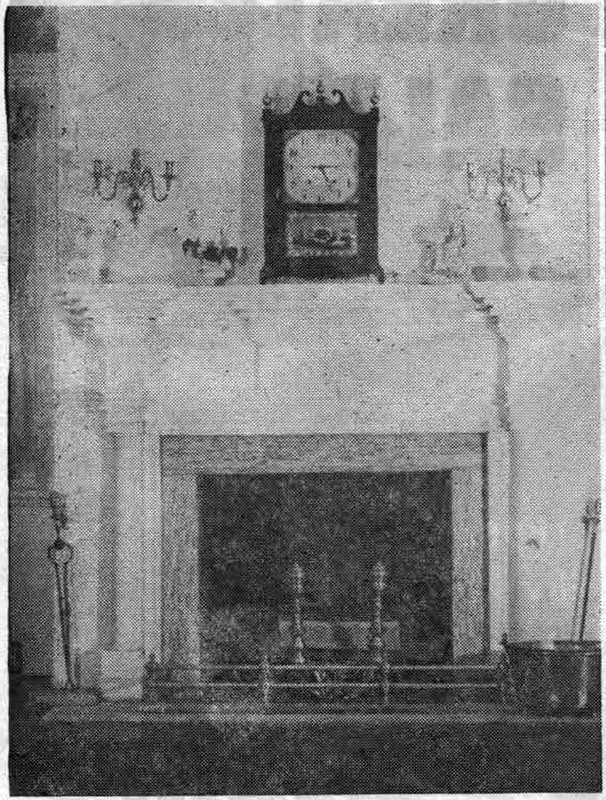 The main room of the east wing contained a large cooking fireplace with excellent, typical colonial, beaded paneling extending from the fireplace mantle to enclose the stairwell. This woodwork was original and in excellent condition, and has been preserved to remain in the township as representative of this building. There was a Swedish-type curved stairway going down to the basement, up to the second floor and into the attic which was situated to the left of the fireplace. This arrangement of curved stairs ascending and descending, tucked into the corner or the room adjacent to the fireplace, is thought to be characteristic of Swedish construction in this area.